and get a free “Have a Cow” bumper sticker! MaryJane Butters wants YOU to have a cow—that “pet” cow you’ve always dreamed about. You know, that gorgeous beau-vine you’ve seen grazing outside your “cow”girl kitchen window. Of course, you’ve wondered what it would feel like to bring a bucket of fresh milk into your kitchen and turn it into butter, your own yogurt, sour cream, and artisan cheeses like Manchego and Brie. MaryJane’s fifth book, Milk Cow Kitchen, is one part milk cow how-to, one part cookbook (75 fuss-free, farmstyle recipes, in addition to 15 step-by-step, super simple cheese-making recipes), and three parts play! Beginning each day by milking her Jersey dairy queens—Maizy, Miss Daisy, Sally O’Mally, and Etta Jane, MaryJane’s Creamery supplies milk, feta cheese, and butter to local residents in her hometown of Moscow, Idaho, where she runs her many businesses that include a successful organic farm, product lines, and MaryJanesFarm magazine, now in its twelfth year. Follow MaryJane’s “milk-her-once-a-day-not-twice” backyard milk cow movement at HeritageJersey.org. 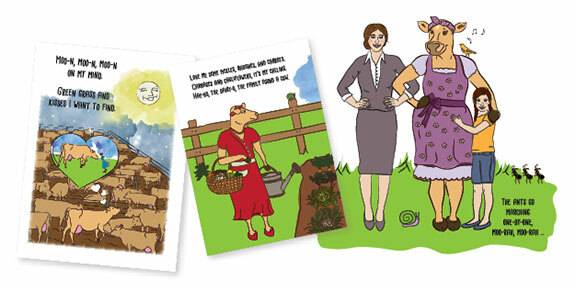 Order through us today, and get your copy autographed, plus receive a free “Have a Cow” bumper sticker! It’s about time! 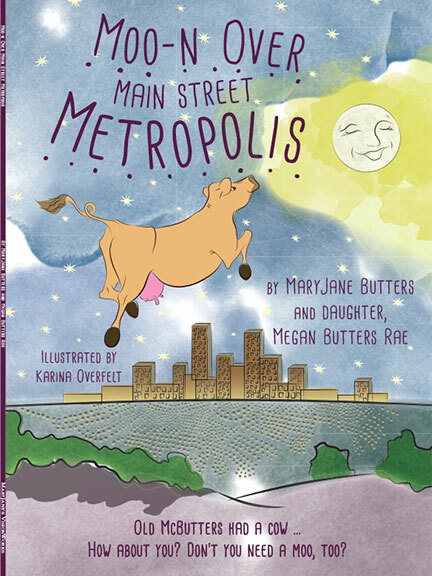 MaryJane and daughter, Megan, have finally written a children’s book, illustrated by Karina Overfelt—a 34-page cowpanion to Milk Cow Kitchen, Moo-n Over Main Street Metropolis.